The SupHerb Dryer drying cabinet is the first professional vertical herb/flower drying cabinet in the world. 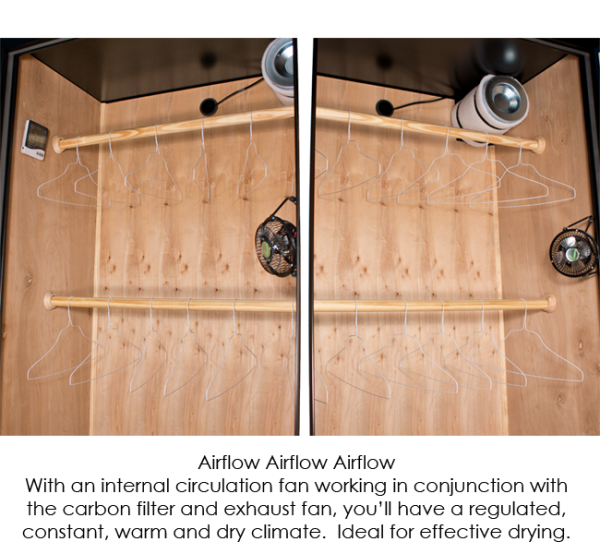 With the SupHerb Dryer, you won’t have to disrupt the Continual Harvest Rotation in your SuperCloset when it’s time to dry, making it a wonderful addition to all SuperCloset systems! SuperCloset is proud to bring you the SupHerb Dryer drying cabinet, the first professional vertical herb/flower drying cabinet in the world. The SupHerb Dryer drying cabinet has been designed to blend into almost any area, perfect for the home, office, or pretty much anywhere! The SupHerb Dryer drying cabinet provides the ideal drying environment. 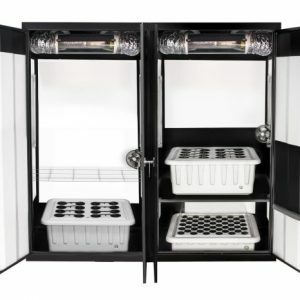 It is important to state that all SuperCloset Grow Boxes and Grow Rooms can act as a good drying cabinet in and of themselves. 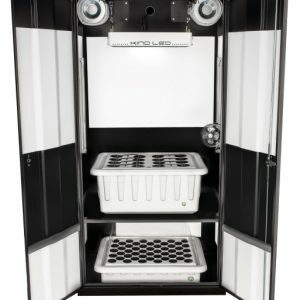 As much as everyone loves the SupHerb Dryer, we believe that we have to tell you that your SuperCloset will also double as a drying cabinet when you harvest your plants in any SuperCloset system. 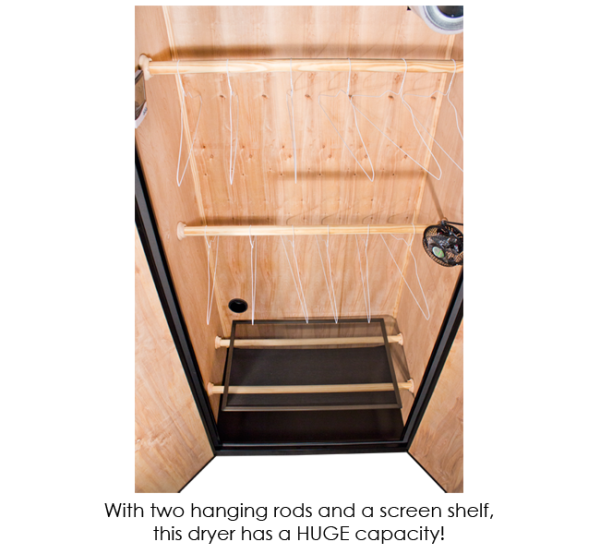 The benefit of the SupHerb Dryer is that you will have a professional separate wooden drying chamber designed specifically for perfectly drying plants. With pine and mahogany walls throughout and several adjustable hanging rods, the drying process is quick and simple. In addition, you will save time and money by not disrupting the Continual Harvest Rotation in your SuperCloset. The SupHerb Dryer is a wonderful addition to all SuperCloset systems and is a huge hit with all growers who want the absolute best and fastest drying experience! What does it mean to dry plants? What are the important details? Drying plants requires several key elements. First and foremost, the way you dry your herbs is very important. Do not let anyone tell you otherwise. It makes the difference between average and exceptional for many professionals. Any Master Grower will tell you that the best way to dry a plant is to hang it upside down vertically, not horizontally. This allows the plants’ internal water and nutrients to seep down to the flower of the plant. Since the fruit/flower will be the last part of the plant to dry, hanging them upside down will thereby improve the quality in 3 primary areas: the look, the smell, and the taste of the fruit/flower. Laying plants down to dry horizontally may cause the weight of the top portion of the flower to crush the bottom portion. Laying plants horizontally may also increase the chance of mold, mildew, and rot. The second primary factor is the drying time. If you dry a plant too fast, then the outside of the flower will be crisp and dehydrated, while the interior will stay damp and moist. Not a good balance. Dry a plant too slowly and it will become highly susceptible to mold and mildew, especially if humidity levels are out of range. 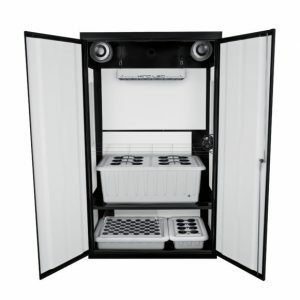 A good drying cabinet has several key design elements: solid construction, regulated airflow, low humidity, constant temperature, and a dry, warm climate. The SupHerb Dryer masterfully manages all of these elements creating an absolutely SUPHERB drying environment! 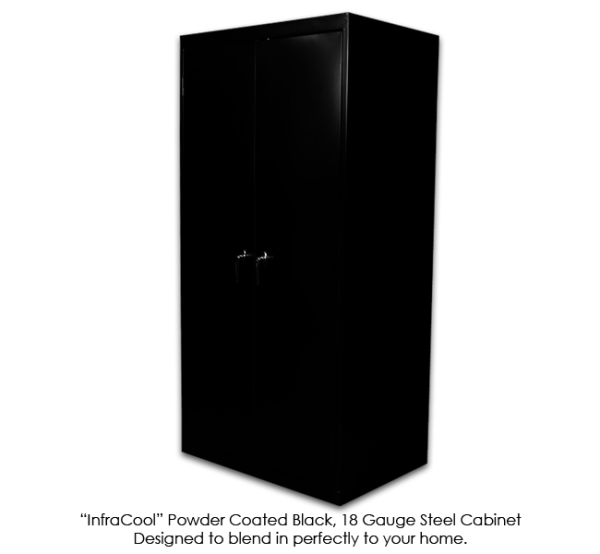 This sleek and discreet, triple-locking, steel cabinet gives no inkling of all the action you have contained within. 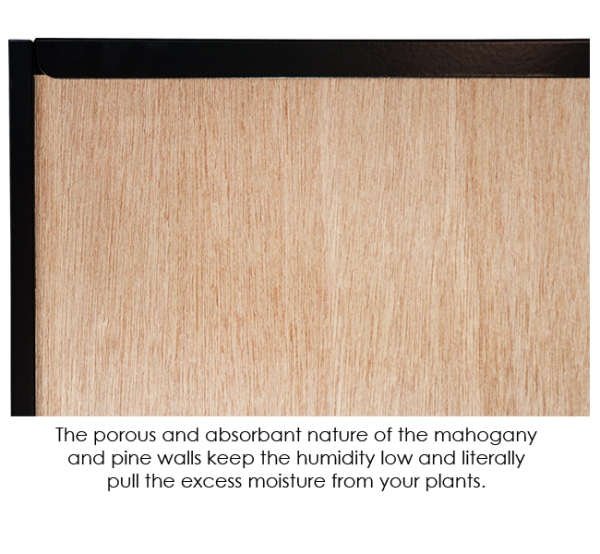 The interior mahogany & pine wood-lining provide the appropriate rate of absorption and assist in keeping your temperature and humidity constant and controlled. Two sturdy and well supported bars extend laterally across your drying cabinet at two levels, each with 6 hangers, giving you plenty of vertical space to hang even the largest of trees. This lower shelf is comprised up of a micro weaved screen that will hold the smallest of plant scraps, while still allowing the important 360 degrees of air flow needed for an even cure. Basil? What basil? This seamlessly designed carbon filter eliminates all odor emanating from inside all of our products. 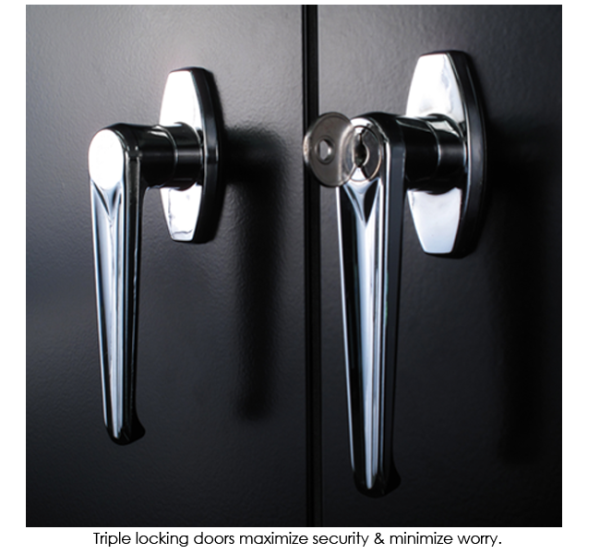 It will last up to two years before needing replacement and ensures the air around your cabinet is as clean as your corporate office. Cleaning is easy! This all important feature creates ideal airflow drying your plants in the perfect amount of time. Not too fast and not too slow, your plants will have a nice even cure from surface to center. The easily adjusted height and tilt angle allow you to always have this gentle breeze surrounding your hanging plants. 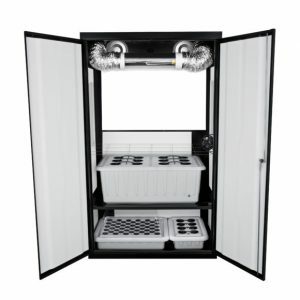 This handy device gives you the ability to make certain that you are providing your drying plants with their ideal environment. 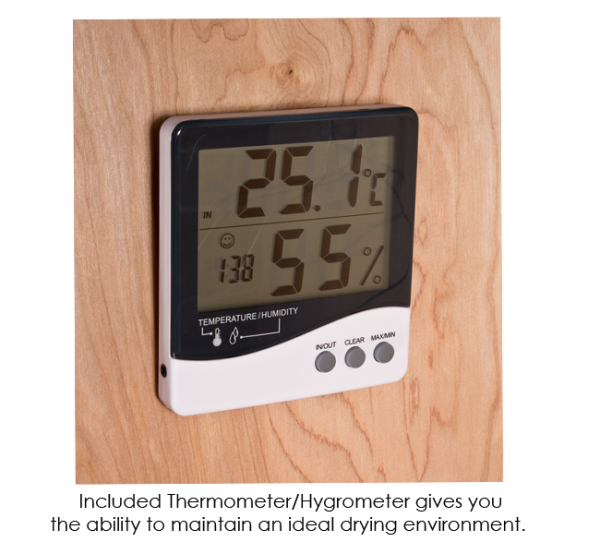 Effectively measures indoor/outdoor temperature and indoor humidity. Stores the min/max values of your temperature and humidity. Switch between °C and °F. Clock function. 12/24 hour mode switch. Includes a waterproof temperature probe.